The Covenant Car Company, Inc. (TCCCI), the exclusive importer and distributor of Chevrolet automobiles and parts in the country, through its trusted and longtime partner Grandcars Inc., welcomed Chevrolet Iloilo in its new home. From its old address in JMB Builiding in Mabini Street, the dealership facility is now situated at Taft North, Madurriao, Iloilo City. 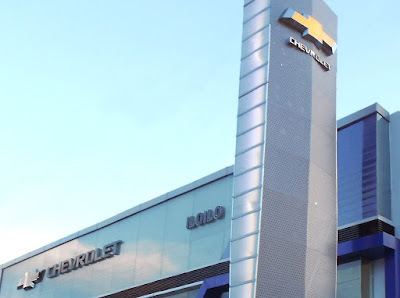 Its new and impressive showroom facility features Chevrolet’s new generation corporate identity standards, providing its clientele with a family-friendly atmosphere and an exceptional showroom experience. Its aftersales facility has been upgraded and now features 16 work bays, equipped with wheel alignment, nitro filling, wheel balancing, 1:1 impact tools per bay, and paint booth, making it a one-stop service shop for Chevy owners. “2006 was the year we opened a Chevrolet dealership in this region. 10 years after, with sales consistently growing at a rate of 20% per year, and an average of 4% market share in Region 6 for the past five years, we feel there is no better time than today to invest in a new facility to house our showroom and workshop and to provide a new home to our valued Chevy customers,” said Mr. Jan Andrew Po, President of Grandcars, Inc. The two-day event was filled with fun activities to make the grand opening celebration truly memorable. A grand motorcade presented the bowtie brand’s strong lineup of vehicles, including the new Chevrolet Sail subcompact sedan, the new 2017 Chevrolet Trailblazer and the new 2017 Chevrolet Colorado. A series of activities were also enjoyed by the guests – from live band performances and marching band to a dance class and magic show for the kids. During the event, Chevrolet Iloilo offered cash discounts, all-in low down promos, trade-ins and test drives for new Chevrolet owners. It also provided free 21-point check up diagnosis and discounts on parts and labor for their customers. The two-day event was attended by TCCCI executives and stewards headed by its Managing Director, Atty. Albert B. Arcilla and Executive Director, Ms. Selene L. Yu, together with Grandcars, Inc. and Chevrolet Iloilo Chairman, Mr. Peter Po and President, Mr. Jan Andrew Po. Chevrolet Iloilo features a selection of models from Chevrolet Philippines’ power-driven lineup of MPVs and SUVs such as the diesel-engine compact SUV Chevrolet Captiva, city-smart crossover SUV Chevrolet Trax, Duramax-powered pick-up truck Chevrolet Colorado, Chevrolet’s best-selling mid-sized Diesel SUV Chevrolet Trailblazer, as well as its full-sized SUV Chevrolet Suburban, and its latest subcompact sedan, the Chevrolet Sail.